Growing up as a strong-headed single child with a privileged upbringing in Calcutta, Devi has learnt much from her surroundings. Her childhood memories are filled with mixed emotions – especially as she remains angry with her mother and the hypocrisy of women in India.On an unexpected journey home, she encounters reality – new stories and experiences of strangers, as well as friends. It has been years since she left Calcutta, yet the city’s untold stories haunt her. This time Devi is back in town to solve issues and above all, through some painful and hard revelations, to make peace with those she can. When they decided to cut down the gulmohar tree at Karaya Road, I remember feeling angry. The tree wasn’t causing any hindrance; it made no noise, it caused no harm. On the contrary it gave beautiful flowers and shade on hot summer afternoons — but people thought it was alright to get rid of it. Every time I passed the empty place where it stood, I’d look up — its absence had changed the skyward view forever. I still remember standing under it on sunny afternoons, scrunching up my eyes to look up through peeping rays of sunlight between leafy-gaps. Blue skies, warm wind that felt rather cool under the shade, and the red flowers on the gulmohar tree. I still remember beggars resting under it. I’d often bring them leftovers from home in a packet, and run off before anyone saw me — I was scared. I was told that touching them would make me lose my class, caste, creed and much more. I was terrified of people discovering me in direct contact with them. We lived there — at Karaya Road — for a couple of years, as our house was under renovation. Pitch-black road, tea stalls on the roadside — smelling strongly of caramelised overcooked milk, with the sweet smell of sugar and ginger, and a dash of strong Assam tea. Police constables in white Calcutta Police uniforms, taking a break, talking ‘bout their wives and children, with Webley Scotts resting on their thighs, as they remained seated on the weather-worn wooden benches — shaded under equally worn-out blue plastic sheets. Every hot summer, after the onslaught of the Nor’wester, all the red flowers would have fallen from the tree, covering the black pitch-asphalt road with a blanket of petals —almost like an abstract painting. A grey Fiat Padmini would be parked on the other side — often covered with flowers and crow droppings. I’ve always wondered why anyone would abandon it. The gates of the Karaya Thana would remain clear of such things, occasionally re-painted with a navy shade of blue. Guarded by a constable holding a rifle with long pointed attachments, easily mistaken for a spear. They had a kind of zoo under the entrance — full of rabbits. Brown, black, white, patched, and even a few born and bred in confinement. I made a habit of visiting them after school with fresh cabbages and carrots. Somehow, quite contrary to Bugs Bunny, they’d ignore the carrots and devour the cabbages. It made me wonder if everything on TV was worth believing. I even fed two fawns in that zoo. They were my favourites since they’d let me pat and hug them. Their eyes were so deep, big and slanted that I would foolishly wish to have eyes like theirs. The fawns vanished after a few months, and I was told that they were sent off to Ranthambore National Park. But I had a hard time believing that story. Much later in my life, I learnt that this was quite an unnatural practice for a police station, and my fears of fawn-curry was realised when I understood what hunted meat actually meant. Pitter-patter-pat. I’d sit near the closed window, taking in the sweet smell of wet earth. “Ai brishti – jhepe, dhan debo – mepe… Come rain – shower down, wheat I’ll give you – measured down,” — we’d be singing in chorus, laughing till our faces hurt and stomachs growled. Stormy dark sky, houses with thatched roofs being blown away, lightning bolts and roaring thunder, staying home to watch the rain — schools closed due to the flooded roads, buzzing of flies while my mind wondered off to a land unseen, unknown. Imagination would spread its wings in a rhyme and rhythm of my own making. Worry was not a part of those carefree days. Sitting on my mother’s lap, giggling and asking millions of questions was not uncommon. Searching for complex answers to the simplest things — was a done thing. But then, time flies. Since aging is inevitable, all these experiences take their place in distant memories. A bunch of people with their suitcases boarded the train. Needless to say, they are going to Zürich Flughafen. My stomach gave a loud growl as a reminder for skipping breakfast. A south Indian man working for the SBB train service came around through the compartment, pushing a breakfast trolley. It’s early in the morning and I’ve slept halfway to the airport already. Every time I cross this stop by train, I am reminded of its historical importance. Apart from the fact that it was one of the first railway stations in Switzerland, built by the Swiss Northern Railway in 1847 as a pioneering attempt to connect Zürich to Baden, Dietikon is also known for the Second Battle of Zürich. In late September 1799, led by the first Duke of Rivoli and the first Prince of Essling, André Masséna, the Republican French army in Switzerland won over the Russian and the Austrian forces in Dietikon. Thus the town name is inscribed on the Arc de Triomphe in Paris. Yet, all that marvellous history couldn’t stop me from flinching at the taste of my coffee. Nine francs and twenty cents for what tasted like it had been squashed out of a pair of old socks, and a croissant filled with air — some would call it being robbed! Then again, I’m not complaining. There is a brilliant saying from Down Under, for all foreigners there — “If you don't like it here, go back to where you came from”; I often wonder what keeps me from doing just that! My first grandchild was born early on an early Saturday morning in March 1984. The eighth day of the Devi Basanti festival. Her twin brother was a stillborn. I had fainted at the news. God’s gift, I’d come to call her, as my daughter could not have children anymore. When my daughter was informed of this, she wailed, “Why couldn’t it be the girl?” Less than 24 hours later, my second grandchild was born. Another girl. I was not disappointed with my daughter-in-law. I thanked God, especially because no one could blame her for giving birth to a girl, when my own daughter had one right before her, in the same maternity ward. I was the first to see my granddaughter. My daughter was in no rational state to take her baby girl. I had never seen a baby this white before, with auburn hair. Neither have I seen a baby yell like she did. She looked straight into my eyes, a hint of blue in her big dark irises, reaching out, wanting to touch my face. I knew it then, that I was caught and I had no escape. But with my son’s baby, I did not feel this pull. I was astonished that his girl was so dark — brown, even black I’d say. This one would be no beauty when she grows up. I felt sorry for my son — to get her married he’ll have to pay. Double a big dowry — I’d imagine. But then, what would I know? I am practically illiterate. Born and brought up in the Bengal Province of pre-partition British India, in a Zamindar household of Bainan, in rural Bengal, I have seen both good days and bad. I was the third girl child in a family of 11 children. We were sent into poverty with the Bengal Famine in 1943-44. I had seen many new-born girls being killed at birth then. No one wanted to have them, with the dowry that would linger in the near future; it became a taboo to have even one of those. I remember my best friend Ranu’s mother telling us she heard her husband talking. All the talk was about the British leaving our country. Japan had occupied Burma, food was scarce and we were under constant fear of being struck by either the Japanese or another cyclone. At this point, Father said he didn’t know which was worse. Rice crops were destroyed, there was hardly much money left and I was pulled out of school. Father started to look for a groom for me. This was the general fate of any girl born before the 80s, I believe. But looking at my son’s daughter, I could only hope that the girl would get a decent education. God! A groom without dowry is out of question for this girl child. Both my granddaughters, Devi and Damini, are about to be thirty now. How time flies! Both strong and independent women, one lives abroad and the other one in the south of the country. I was right about my son’s daughter. She blended better in the south, than in the north. Many love affairs, boyfriends, fiancés and much wastage of time and money, and she’s still not married. My son doesn’t make any effort on that matter either. He enjoys her salary and openly brags about it. It was not enough that he sucked all my wealth out of me, now he uses his daughter, and that idiot doesn’t even realise it. At least she is well-educated, dumb but has her degrees — and I sure hope she gets an open-minded south Indian man to marry her. While the other one, she exceeds my expectations. Educated, smart, beautiful, kind and rebellious. With my daughter as a mother, and vindictive cousins from both sides, she is a strong, carefree soul who doesn’t listen to society: she makes her own rules and even takes her own path. Her willpower is strong — she reminds me of my daughter, but better. Even though they are never on talking terms. Here’s something about my daughter, she is constantly complaining and has the morals of a religious guru. She took after her father, and is very tall. Never learnt housework as her father had spoilt her silly. It was a war to get her to complete her education, cause she’d prefer being at the Durga temple, than educate herself. At twenty-five years old she was as lanky as a fourteen-year-old boy. Only her few failed pregnancies had given her semblance of breasts. Her round face and thick, curly black hair made her look like the perfect Tamilian, but we are Bengali Brahmins. Her quarrelsome nature got us into trouble, but saved her from her in-laws. My daughter does not know when to stop. But once she has made up her mind about something, she wills it into being, though only to her own benefit. Once it so happened that Devi heard it. She answered before running off to her room. Then she looked right into my eyes, smiled and winked. I couldn’t help smiling, though I hoped my daughter hadn’t seen. “Come back over here at once, you mean, selfish girl! How dare you talk to your mother like that!” My daughter was off her bed and on her feet so fast, that it was clear my granddaughter had started another war. I have lost count of my own age; people say I’m eighty and I believe them. These eighty years of my life, I might not know much about books and education but I know of death, foul-mouthing and being deceived. I have lost much and gained very little. I know how some words jab at you so hard that you cannot breathe. Three heart attacks later, I am still standing. The last one was about two weeks back, I was sure it was my time. But no, Devi wouldn’t let me go. Not just yet. Every day I reminisce; I look back and think of all those good and bad memories. Sometimes, I can’t breathe. Sometimes I’d sing to God — “the day has passed onto dusk now, help me cross over.” Sometimes I’d stay up, sleepless all night, and be sure to see my mother, my father, my sisters and even my husband. In old age, loneliness is a burden, and even hallucinations of the loving dead are most welcome to satisfy my craving soul. My husband died about thirteen years ago. He was seventeen years older than me. Very well educated, worked for the North Eastern Railways, and retired in some prestigious position; his title has skipped my mind with age. May 7, 2001, it was the day my whole world collapsed. I hardly knew how to fend for myself. In our culture, women shave their heads, stop eating anything extravagant like fish and meat, onions and garlic, and move to widow shelters in Banaras. I didn’t know if that was my fate. Although I knew it was the correct path, many elders took it before myself, then why couldn’t I? I think I was hoping for it to be different for me. I was a year or so shy of seventy, and wanted to live near my children and my grandchildren. I wasn’t ready to be a widow, let alone punish myself for something that was not my fault. The death of her grandfather came as a shock for Devi. The girl had never experienced death or loss before. But the circumstances under which my husband died, planted bitterness in the child. She could not forgive her uncle or her mother. More so, when my son took all my money, jewellery, even the house that my husband had built and put me out on the streets. I was left with nothing. I came to my daughter for aid, but she accused me of having a negative influence on my granddaughter and turned me out as well. I had myself a little apartment over at College Street. The old house was built when I was a little girl; it belongs to my brother now. Inheritances are never in favour of any daughter: perhaps the reason why my own daughter hates me so much. Or so I feel. It took me a good few months to gather my wits. I had never lived alone before. It was difficult to figure things out by myself. But eventually, I did. You see — as a child, I was free-spirited. My brothers even say that I was an intelligent child. I was allowed to attend Bainan High School some seventy years ago, at a time when most women, even in the middle and upper classes were denied education. But I studied hard till after the Bengal Famine, when father decided to take my sisters and me out of school due to money issues — my brothers continued till their college graduation. So I knew how to read and write, but I didn’t know how to deal with official papers and systems to get government support. Especially because nothing is in Bengali! The British had left our country but our country couldn’t leave their language. So I asked my neighbour’s wife, Shikha, for help. That day was the first time in decades that I raised my voice in public. I was not proud of it, for it is not good for women to raise their voices, or so I have been taught. But it felt good. It felt good to stand up to a jeering stranger and say what I wanted to say — it came from my heart. On my way back, I bought muri-chanachur bhajaa for myself, and an elderly beggar woman I often see near Puturam’s sweet-stand. Dirty white thaan , prickly white hair on her shaved head, and bent over with age. When I handed her the packet of muri-chanachur, she didn’t say much; but I’m almost sure I saw tears in her greying eyes. Shortly after, I heard the news. Not from my daughter but from my son. He called me to say, “Devi’s getting married tomorrow.” I was not invited by my daughter; but was grateful to my son for calling and letting me know. That night I cried. Alone in my small room — I wished I was dead. My sweet little girl was getting married and I was not even invited. Ever since I held her for the first time, I knew she was special. God knows how much my daughter shunned her. I brought her up, and I don’t know how, but when my daughter wouldn’t — I nourished her. She would call me Ma. Like a duckling who wouldn’t know better! That child was getting married, and I was not invited. Perhaps it was this, and loneliness that made me to get back in touch with my son. I tried so hard to please him, hoping that when it was his daughter’s turn — I wouldn’t get left out. Soon his demands started flowing in, “Ma, my daughter needs some pocket money, could you help?” and “Ma, it is her birthday — she will come to see you, do show her you care”; “Grandma, I want the new foreign perfume, my friends have it but I don’t, it costs a lot, do you have any money you can give me?” and I’d give them all my pension money without complaining. I didn’t mind. I had company. Soon they took me back to the house my husband had built. My daughter-in-law wasn’t very happy about my return though. I could feel it. It was obvious that she couldn’t have her family over. I never objected to her bringing her family, but my stay was visibly not welcome. My daughter-in-law; she is crafty, can manage people like flipping a roti. Right after both my children got married, we invited my daughter and her husband for Jamai Shoshti . Our modest house in Kharagpur had nothing extravagant, but we had good food. My husband and I had agreed to buy my son-in-law a gold chain. He deserves the best, that boy. Took my daughter off my hands without any dowry, never asked for any money and still takes good care of her and me. I had saved up to pay the jeweller, ready to break my savings from the lakhhir-bhär — when the doorbell rang. It was my son and my daughter-in-law. He wanted money as usual, and his father obliged. After they left, my husband confessed that he gave them the budget intended for the grand feast. Again, I had no say in his choice. It was a Saturday, so we couldn’t go to the post office to pick up money, and I had to go to the jeweller to get that gold chain. My husband said, “We have to use the money intended for the jeweller, and on Monday I will arrange the rest from my post account”; his decision, my command. But when I went into our bedroom, where my savings were kept, I almost fainted. The lakhhir-bhär was broken and lying on the floor in a heap — with all my money gone. I was devastated. I couldn’t stop crying. All I could remember was my daughter-in-law had gone into that room to change her sari. No one else had been inside… I did hear some muffled cracks and jingles while she was in there, but never in my wildest dreams I could never imagine her doing this to us, under my own roof! A girl we took in with open arms, in spite of her inferiority of birth, race, caste and creed. They had all warned me not to let my son marry an East Bengali refugee’s daughter — with no money, no prospects and no family prestige. But I paid no heed. My son was in love, and he wasn’t marrying into her family — she was marrying into ours. That automatically lifted her status and class. My daughter wanted Nellie as her new sister-in-law, and even coaxed her father to agree. So we agreed. That incident, even if forgiven, was never forgotten. Especially when my own son and daughter-in-law threw me out of my own home — built by my husband. Whatever that means. How would I know? But what I did know is my other granddaughter, Damini, is not as pure as her mother claims or her father portrays. Every afternoon she had her boyfriend over and I heard them in the bedroom: the rhythmic screeching of the bed, the muffled moans, her shy giggles —I pretended not to hear nor see. She took money from me to go to clubs and discos, and I know for a fact that she drinks and smokes heavily. One night she was dropped off at the square, all drunk and senseless in her tight salwar-kameez. Neighbours had come running to inform my son. They brought her home and never talked about it. I saw and heard it all, from my tiny room; her mother and her — cooking up a plot to snare a rich groom. The next morning, I decided to leave for my old apartment in College Street. There is only so much an old widow can take. I understood immediately. It was not about Damani, it was about my son’s ego. My sweet girl had not just left her husband, got her divorce, but went abroad for her studies. My son could not digest it. So I agreed to take out a loan of four lakh rupees, in order to finance my son’s ambition. That was the last I heard of him. Time flew by. I fell ill. Shikha contacted my daughter; it was getting to be a war with my brother too. He wanted to sell the house and I was just a burden — a hindrance. He came and beat me up one afternoon, over a discussion that turned into a property quarrel. I think it was that, the last blow before I fell sick. My daughter, Gauri, gave me the ground floor guestroom of their home. Her house is a lot bigger and nicer than my son’s. This too was a cause for sibling jealousy and rivalry. But that fool doesn’t realise that her greatest treasure is her daughter. A book that stays with you long after you have finished reading it. “If you are looking for a quick read, this book is not for you. This is a book that makes you pause and ponder. There were times when things went over my head and I had to read the paragraph a couple of times to get what the author was trying to say; places where it got a bit too technical to enjoy. But as I have said earlier this is not a book to be enjoyed. It is a book to be pondered upon .Definitely not a book to read when you are tired or at the end of a long day. Nice write on a sensitive and burning issue. “The Girl Child' by De.B. Dubois is primarily the story of Devi, a girl from Calcutta (now Kolkata), who returns to her motherland after many years. How does she take the sudden change of culture? Has anything changed here in all these years? Does she feel welcome in her own country and state, or the same old demons return to haunt her again? I commend the author on writing about a sensitive and burning issue, of being a girl in a country like ours, and doing justice to it. It's not only Devi who had to face those demons, but her grandmother, her mother, and her friends had to too in different forms and sizes. “Born into a well to do family Devi’s life is a bag of mixed emotions. While on the one hand she has a very liberal minded police officer for a father, her mother turns out to be the exact opposite. Clash of ideologies and emotions forms the basis of the story which incidentally does not turn out to be the story of just our protagonist Devi, but of all the women in her family right from her maternal grandmother Nimai to her cousin Damini. It brings us face to face with some bitter truths like the differential treatment meted out to siblings of different gender both at home and in society leaving them scarred for life or bitter and envious. It tells us how they who stand up for their rights are termed as rebels or worse still as ones of loose character, and how they who don’t fight and resign to their fate die a silent death each day. In fact ‘The Girl Child’ reflects the plight of majority Indian girls so well, that I’d term it a one of its kind story. It is unique. ‘The Girl Child’ is not just a mirror to the plight of innumerable women and children of the female gender, but is also a study on the psychological impact that the discrimination meted out to them, has on both their physical and mental health. While some may rebel, many give in to their fate and ultimately get overshadowed by the feeling of being a worthless burden on them who bear them. And who finally bears the brunt of their low- esteem? Their children. Narrated in simple language spiced with Bangla terms here and there ( do note that the glossary of these the story and its characters are easily relatable. One can’t help but travel with Devi on her journey both into the past and the present and marvel at the changes that have taken place over time. So what is it that pulls me back from giving this unique novel a five star? The narrative. Felt it was bit overburdened with facts in places. These in turn acted as speed breakers affecting the natural flow of the story. Brutally honest and a compelling read. 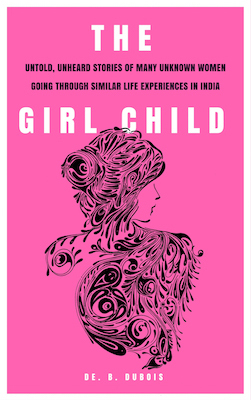 “'The Girl Child' is a brutally honest book by the author depicting the lives of women in her life as well as the women she has met. Devi is a single child who is brought up in a household where her father is indulgent of her rebellious behaviour while she has experienced neglect from her mother right from her growing up days. Devi is revisiting her City after many years to visit her ailing grandmother. Her Grandmother has been her source of strength and support through her childhood. So what does Devi experience during this trip of hers? Are situations and circumstances the same since she left her City. Has people's treatment of the women changed over the years? The author has blended this fictional story with a commentary on the issues faced by girls and women in the country in a very beautiful and honest way. It does present to you the raw truth in a head hitting way. Her observations as narrated from the point of view of Devi are very realistic n prod you to think. This is the first book of the author that I have read and have really liked it. There are so many things mentioned and so many topics touched upon that I read this book very slowly to read assimilate n understand it.